SFI 18.1 Harmonic Balancer for Ford 2003-2004 Cobra with Metco and Lightning Force Adapter. Using the combination of our #811 6 Rib Balancer along with our #963 "Metco" adapter, 03-04 Cobra owners now have an SFI approved option to the stock Balancer. Our adapter is designed to adapt the Metco Motorsports, Lightning Force Performance or Moto Blue interchangable crank pulleys to our SFI approved Balancer. NOTE: The use of this aftermarket balancer requires the removal of the stock crank support cage. 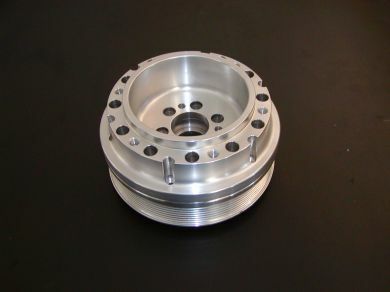 Please see Part #813 for an OEM style Balancer for use with the stock crank support. SFI 18.1 Harmonic Balancer for Ford 2003-2004 Cobra with Metco and Lightning Force Adapter. Using the combination of our #811 6 Rib Balancer along with our #963 "Metco" adapter, 03-04 Cobra owners now have an SFI approved option to the stock Balancer. Our adapter is designed to adapt the Metco Motorsports, Lightning Force Performance or Moto Blue interchangable crank pulleys to our SFI approved Balancer. NOTE: The use of this aftermarket balancer requires the removal of the stock crank support cage. 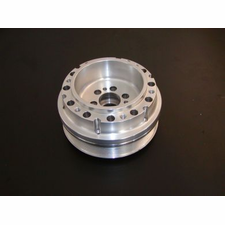 Please see Part #813 for an OEM style Balancer for use with the stock crank support.